How do behavioral changes affect ecosystems? It is old news that different populations of the same organism often differ from one another in a number of characteristics. Populations may vary in color, size, morphology, behavior – just about anything. A common cause of such diversity is that populations face different environments that favor different traits. In particular, local predator communities (that is, how many predators there are and what species of predators) can be highly variable and can affect prey behavior. Where predators are abundant and dangerous, prey ought to behave cautiously by hiding, fleeing readily, or being inactive and secretive. When the risk of predation is low, prey ought to pursue opportunities to eat and reproduce. My doctoral advisor, Tracy Langkilde, and I tested whether populations of wood frog tadpoles (Lithobates sylvaticus) from ponds with high predation pressure showed stronger behavioral responses to predators than tadpoles from ponds with low risk of predation. When they smell a predator in the water, wood frog tadpoles (like many tadpoles) typically become inactive, swimming less and hiding more. We think they’d rather be active so they can consume lots of food, grow large and fast, and turn into frogs before their pond dries. But, if there’s a predator around, it’s more important to not get eaten. Wood frog tadpoles swim in a pond mesocosm. We selected 18 ponds with wood frogs across Pennsylvania, representing a range of predator communities. Early in the year, I collected freshly-laid wood frog eggs to bring back to the laboratory so I could measure the behavior of the tadpoles. Later in the year (when tadpoles were swimming in the ponds), I used a net to collect random samples of animals from each pond. I’d then sort through the contents of the net to count the number of each kind of predator I found. These included dragonfly nymphs, newts, and other salamanders and insects. These data were used to assign each pond a value for how high the predation risk was; the more predators, and the more ‘dangerous’ these predators, the higher this number would be. 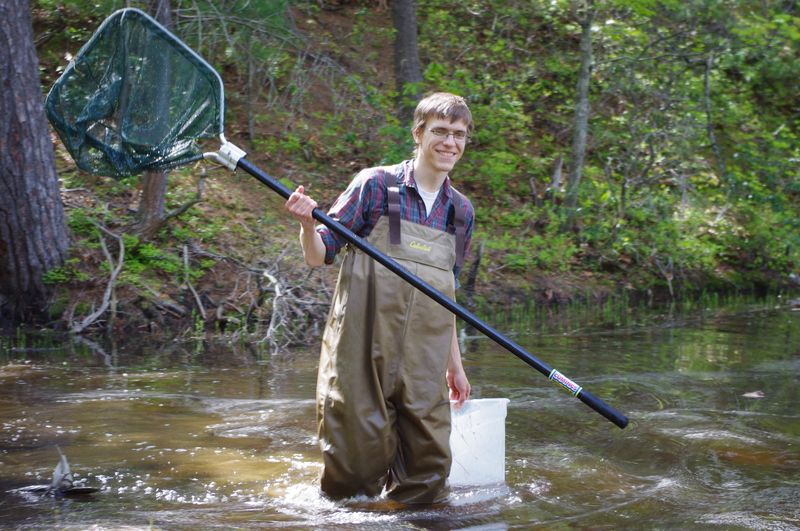 Brad Carlson uses a dipnet to sample a pond community. But what about those eggs I brought back to the laboratory? We hatched them into tadpoles at a research farm at Penn State University and, when the tadpoles were old enough, introduced them to pond mesocosms. Pond mesocosms are artificial ponds, smaller than most natural ponds but big enough to be reasonably realistic environments. Our mesocosms were created by filling large cattle-watering tanks with water and adding standard amounts of dead leaf litter. We also added a small amount of pond water, introducing bacteria, algae, and other microorganisms which flourish and create functioning ecosystems. Each pond that we collected eggs from was represented by two of the mesocosms. One mesocosm had a cage floating in it, which contained a dragonfly nymph (Anax junius), voracious and hardy tadpole predators. Regularly feeding the dragonflies extra tadpoles in these cages ensured that the mesocosm water smelled of danger but that the experimental tadpoles wouldn’t actually be eaten. The other mesocosm served as a control (with an empty cage), allowing us to measure the normal, ‘baseline’ activity levels of these tadpoles. 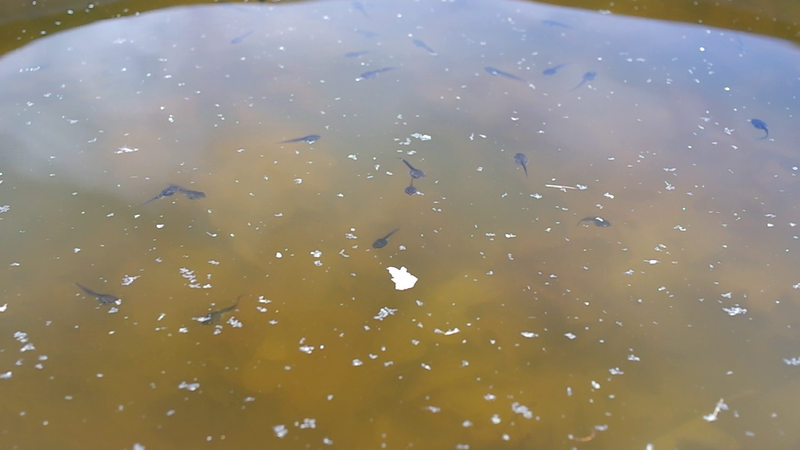 After a few weeks, I measured how active the tadpoles were by quietly walking around the mesocosms and counting how many tadpoles I could see (their ‘visibility’) and how many of those visible tadpoles were moving rather than still (their ‘movement rate’). 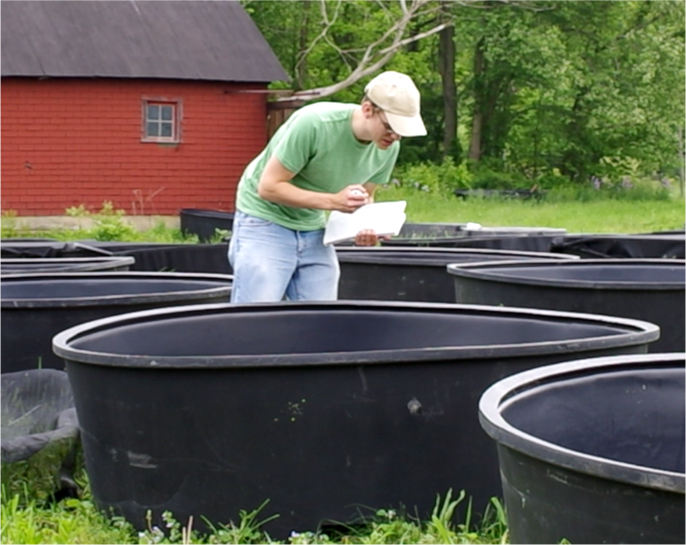 Brad Carlson observes tadpole behavior in mesocosms. Our analysis revealed that tadpoles from ponds with higher predation risk responded more strongly to predators than tadpoles from other ponds, spending less time visible, and slightly tending to move less. A good explanation for this pattern is that tadpole behavior is adapted to local environments, with generations of selection in high predation environments ensuring strong responses to predators. This is interesting in its own right though not too surprising. What we really wanted to know was whether this kind of variation in tadpole behavior affects the pond ecosystem. In particular, antipredator behavior often leads to trait-mediated indirect interactions (TMII). In this case, the TMII is an effect of the presence of a predator (dragonfly) on the tadpole’s own food (periphyton, a film of algae and other microbes and detritus growing on submerged surfaces). Dragonflies shouldn’t directly interact much with periphyton, but they should indirectly via their effect on a trait of the tadpoles – foraging activity. If dragonflies cause tadpoles to be less active and thus eat less food, then their food (the periphyton) should increase in abundance. We expected, therefore, that populations of tadpoles that respond strongly to predators should produce larger increases in periphyton than less responsive tadpoles. 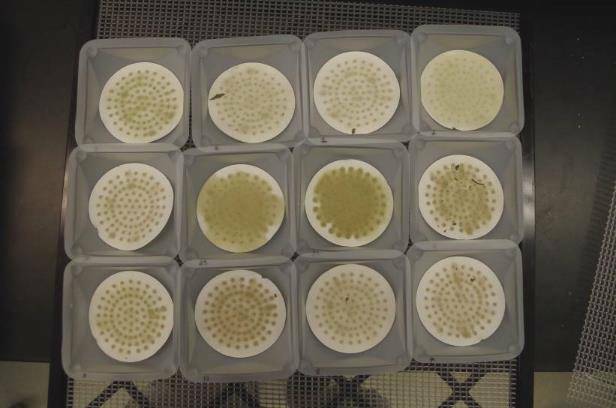 Pieces of filter paper with collected samples of dried periphyton (green and brown matter) from tadpole mesocosms. To test this we simply measured the mass of periphyton in the mesocosms by removing tiles we placed in their, scraping off the periphyton, and weighing it after drying. We found that, as expected, mesocosms with caged predators had much higher biomass of periphyton. However, the amount that periphyton increased when adding predators didn’t depend on how strongly the tadpoles responded to predators, nor did it depend on the predation risk in the pond from which the tadpoles came. In fact, tadpole behavior overall was a generally poor predictor of the amount of periphyton in the mesocosms. This was unexpected, as we established a clear mechanism by which periphyton increases with predators (dragonflies decrease tadpole activity, decreased tadpole activity increases periphyton). Apparently, the amount the tadpoles actually eat is not perfectly linked to their activity: some tadpoles may become very inactive when predators are introduced, but still consume as much food as tadpoles that barely respond to predators. Do they switch their diets, or eat while hiding in refuges, or do most of their foraging at night? And, are tadpoles from ponds with more predators better at compensating for lower activity levels? These questions and more still remain, and will help us as we continue to try to understand how variation in behavior can impact ecosystems.